Our organization holds expertise in manufacturing, supplying and exporting a wide range of Parrot Feed. These are processed at our premises following all hygienic standards and after extensive research. This ensures that the feed we offer is rich in nutrients and free from adulterants, vital for the health of parrots. Our professionals take due care to pack the orders in bulk quantity using moisture proof packaging material. 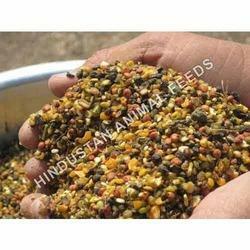 Avail from us an extensive range of Parrot Feed, which is offered at reasonable rates. The feed we offer is hygienically prepared under the strict supervision of our quality auditors. Our range is easy to digest, free from bacteria and virus and protect from micro-organism contamination. The range offered by us comprises parrot starter feed, parrot grower feed, breeding parrot feed, laying parrot feed and all types of parrot supplements.